Much has been made of AI’s role in serving customers, and AI-supported smart devices have invaded homes everywhere — Amazon’s Alexa was even used to order millions more Alexas as Christmas presents in 2017. Artificial intelligence is embedding itself in our technology-obsessed culture, but not every industry has taken advantage of AI’s utility. Adam Honig and his co-founders at Spiro saw an opening to use AI to drive the sales experience. Businesses utilize CRMs to compile and track the data needed to support ongoing sales efforts and pinpoint new sales opportunities. But Honig, the CEO of Spiro, says that many companies aren’t getting the data they need from these platforms — they aren’t used correctly, fully, or consistently, meaning the information these sales teams are working from is skewed. 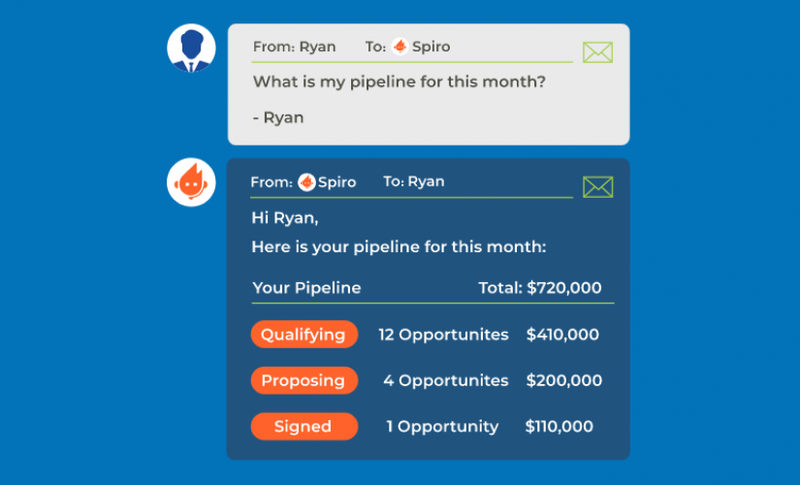 Spiro is an AI-driven CRM, complete with a conversational email interface, or an email bot, that utilizes existing data — from salespeople’s calendars, emails, and more — to lay out a schedule or to-do list for a salesperson and anticipate next moves. The AI function can process existing information more quickly than humans poring over spreadsheets can, empowering the CRM to predict how many follow-ups it may take — and what format will be most effective — to close a deal. But that’s not where Spiro sees AI’s intersection with the sales experience ending. That’s what confounds many: How could an industry fueled by personal relationships, charisma, and camaraderie be driven by AI? Sales is surely a people-driven arena, but it’s already focused on tracking metrics and moving the needle by predicting human behavior. Honig and his co-founders realized, through their CRM work with more than 3,000 companies, that the problem lies in the data being gathered. Is This the End of Sales as We Know It? Beyond increasing productivity and efficiency, automation can relieve salespeople from manual tasks, freeing them up for more high-level strategic efforts. Though many predict that AI will lead to mass unemployment as human beings are relieved of their duties, AI is designed to elevate the skill sets needed in each industry so complex, nuanced problems with big implications are solved by humans who will have to absorb those outcomes. What that means is that to compete, salespeople selling to businesses have to be prepared to embrace solutions that make them more effective with customers. “In practice, this means using AI solutions to do things that technology can do better, like entering data, and let them focus on the things that people do better, like building rapport and really understanding the needs of a customer,” Honig explains. The biggest benefit AI may offer to the sales process is its data-gathering capabilities. Whereas some salespeople operate from instinct or their “gut feeling” about a customer and his needs, sales is often now held to the same standard and expectation of ROI as most marketers and advertisers. Without numbers, it’s hard to maintain a budget, commission, or even a permanent position. Despite this need for hard data, many sales departments track information haphazardly, failing to record final contract numbers in a database or neglecting to indicate how many touchpoints a lead went through before finding his way to the bottom of the sales funnel. That lack of information may not impact that specific sales process, but it can alter an entire team’s goals and predictions. AI-driven platforms like Spiro can grab the data where it’s buried and build their own reports, adding a layer of analysis and interpretation for human reviewers. Honig says Spiro’s reports have been shown to contain eight times more data than regular CRM reports, underscoring the power of AI. Thanks to these insights, Spiro’s customers have indicated they reach up to 47 percent more prospects each week. A big factor in reaching more customers is having the AI predict which prospects won’t close so salespeople can focus on others. Human hope makes it hard for sales professionals to shut down a potential source of income when they can’t see where the road ends. In other words, Honig predicts AI will become salespeople’s constant companion, designed to help them make more money. Sales may be a people-driven industry, but AI is on a path to ensure it values data as much as instincts.